Every organization relies on the generosity of volunteers and donors to achieve their mission. 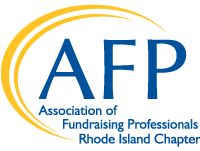 AFP-RI's National Philathropy Day event is an opportunity to show them how much you appreciate all they do by recognizing hem as your Partner in Philanthropy. A Partner in Philanthropy is a person or business which has furthered the achievement of your non-profit organization's mission through significant generosity, outstanding leadership or exemplary volunteer contributions. Each organization can honor up to two Partners in Philanthropy. A Partner in Philanthropy can be an individual, a couple, a small group, or a business. To make sure you don’t miss any important information, ask to join our email list by sending an email to info@afpri.org.